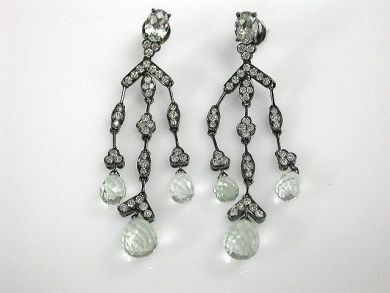 A beautiful pair of 18kt black rhodium plated gold earrings that features 2 oval checkerboard top faceted cut light green quartz, est. 1.34ct; 6 briolette light green quartz, est. 9.73ct and 76 round brilliant cut diamonds, est.1.35ct (SI-i1 clarity: G-H colour).